In a word: Oom-pa with oomph. 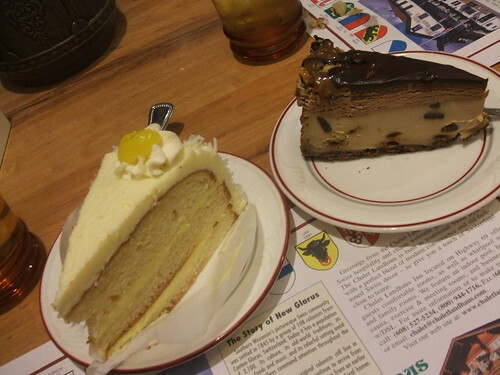 JM ate the wienerschnitzel and a slice of turtle cheesecake and a lemonade. Nichole ate the kaeseküchlein and a slice of lemon chiffon pie with coffee. We both had the rösti, spätzli and salad bar. The bill was $42, or $21/person, plus tip. JM and Nichole gave New Glarus Hotel an A (see our grading rubric). The first thing we forgot about New Glarus is that it's insanely popular with tourists, especially those coming from the south to get away from the windiest of cities. The second thing we forgot is that we were visiting on Valentine's Day weekend. Despite these challenges, and a little weather en route, in the end a little Swiss hospitality and some live polka music made this an outing to remember. Having come in from the snow and the fragrant street (it smelled of baking ham, we swear) we admitted to the hostess that we didn't have a reservation, and were left at a loose end in the reception area for more than a couple minutes without much acknowledgment of our presence. It might have been easy for us to feel like outsiders, but once we seated and placed in the able hands of our server, we wanted for nothing. The Valentine's Day prix fixe ($64) looked charming, and included champagne, soup, salad, tenderloin, Wienerschnitzel, shrimp, vegetables, rösti (cheesy potatoes), spätzli (dumplings), and chocolate fondue. We opted for items off the regular menu and weren't disappointed. 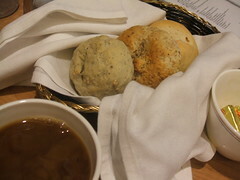 Our dinner started with a bread basket - a white roll, not quite perfect but a sight better than average; a cracked wheat roll; and a pale blue-gray roll that turned out to be the best of all, which owed its interesting hue to fragrant and flagrant black pepper. The salad bar at first glance seemed average, but more fresh bread, crisp spring greens, beets, a citrus carrot slaw, herb-infused butter, and bricks of good cheese added up to a big win. 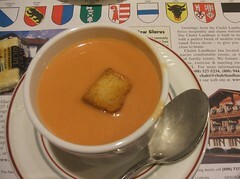 On top of that, the tomato bisque balanced a rich creaminess with fresh tomato flavor. We were seated in the first booth next to the polka band, doubtless because of our lack of reservations. We figured it just added to the entertainment, and were enjoying watching the dancing patrons ehen our server approached apologetically and said there'd been a mix-up that would delay our meals, and asked if she could offer us complementary desserts. Hooray, we said. Especially since we didn't really notice a delay. Shortly thereafter, our entrees arrived. 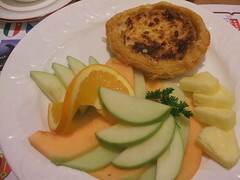 The kaseküchlein, a small cheese tart in puff pastry, was served with fresh fruit. It was light and flavorful and very feminine. 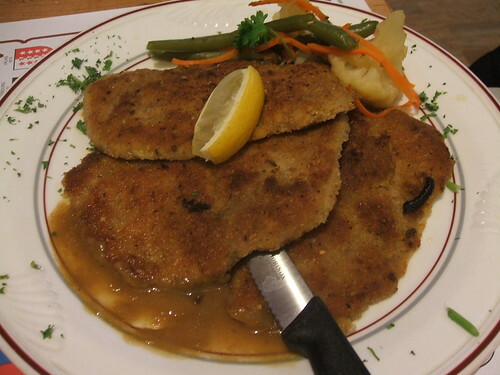 JM's Wienerschnitzel was more hearty. A plate of veal appeared before him with just a couple beans and a cauliflower floret in a nod to the five-a-day lobby. He found it delicious, tender and filling. His only kvetsch was that there was not much gravy, as flattened veal tends to be dry to start with. The thing about Swiss cooking (and German, for that matter) is that there isn't much to play with. But given butter, salt and pepper, a skilled person can do great things, like this Wienerschnitzel and the accompanying rösti and spätzli. 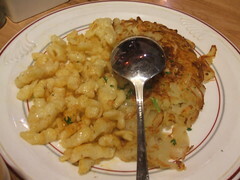 The rösti tasted just exactly how they look here, but the spätzli were wonderful, pillowy dumplings, bathed in butter. We are so very glad that they offered us dessert on the house, because we may not have splurged and the bakery course turned out to be the best part of an already fine meal. Here's the thing: Madison is short on bakeries. Or at least we don't have enough in our daily lives, which may see the occasional bagel but which don't make the time for that brilliant Teutonic institution, the Kaffee und Kuchen Pause. With cakes like these, only a fool would pass. The lemon chiffon cake was preternaturally light and cloudlike. There were grains of sugar to add texture to the frosting, while the cake itself was nicely lemony with a clean finish. The turtle cheesecake? Gone before too long. It too was lighter than anything we'd had in Madison venues, with three layers that complemented each other beautifully. New Glarus Hotel made a memorable Valentine's Day treat and we think they'd do as well any day of the year. Oompah with oomph, and oodles of umlauts. I grew up in New Glarus and have recently moved back. "The Hotel" has always been my family's go-to restaurant for Friday nights and special occasions. I'm glad to see such a positive review here. I'd give them an A, too! Hans, Stephanie, Ted, and Fritzi create such a warm atmosphere - and such delicious food!